The device comes with all cables and accessories for easy connection and handling. The Opticheck enables operators to perform preventative maintenance and responsive service to ensure that installed flowmeters are performing to specification. When the Opticheck tool is connected in-line on site, it gathers measuring data to ensure that the flowmeter is performing within 1% of the factory calibration, with a confidence level of 95%. The baseline for comparison can be historic repair data from the factory or on-site test results after performing a full verification. The Opticheck is capable of verification of the range of Optimass Coriolis mass meters, Optisonic ultrasonic flowmeters and Optiflux, Tidalflux and Wateflux electromagnetic meters. 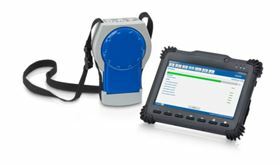 The equipment provides both a hard copy verification report for every flowmeter and digital storage of verification data in the internal database of the industrial tablet. It can be used within the water and wastewater, chemical and petrochemical, and minerals and mining industries, as well as in other flow measurement applications.